Width of rectangle in pixels. Array of X and Y position. X is the distance in pixels from the left of the canvass to the left of the rectangle. Y is the distance from the top of the canvass to the top of the rectangle. Defaults to array(0,0). $editor->draw( $image, Grafika::createDrawingObject('Rectangle', 85, 50)); // A 85x50 no filled rectangle with a black 1px border on location 0,0. $editor->draw( $image, Grafika::createDrawingObject('Rectangle', 85, 50, array(105, 10), 0, null, new Color('#FF0000'))); // A 85x50 red rectangle with no border. 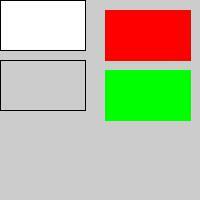 $editor->draw( $image, Grafika::createDrawingObject('Rectangle', 85, 50, array(105, 70), 0, null, new Color('#00FF00'))); // A 85x50 green rectangle with no border.